NOTE: Joel Cherrico is no longer the official Guinness World Records™ holder for the title, and you can view the current record holder on their official website here. 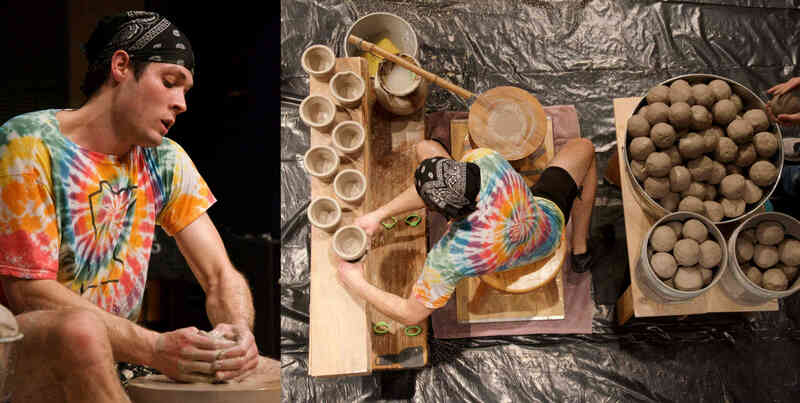 However, this important project is notable in Joel Cherrico's lifelong pottery journey. The record was 150, and Joel threw 159 pots in one hour. He performed this feat on a traditional Japanese style kick wheel, instead of an electric, motorized wheel like the previous record holders. He added this extra level of difficulty because he is committed to using his art to inspire people globally to attempt and achieve great goals. Each pot comes with one official Guinness World Record certificate and a protective folder. With your purchase, you are directly participating in this record. Your certificate from Guinness World Records lets you be involved as an Official Participant, because you are now part of this remarkable accomplishment by showing your support and buying a limited edition planter. Carved a number and his artist signature on the side of each pot. Pressed his thumb print into the clay, just below the signature. Poked a hole in the bottom of each pot, so they function as planters. Threw a custom water catch tray for each planter. Glazed and fired each planter in either a wood burning or electric kiln. NOTE: The number carved on each pot does not represent the actual order in which the pot came off of the wheel during the record attempt. Multiple people assisted with moving pots off of the pottery wheel and it was not possible to keep pots in order. However, this pot is aesthetically important in the series of 159 world record pots. The carving and painting show the importance of this piece of art historically and aesthetically. This planter was fired nonstop for four days in a wood burning kiln on the College of St. Benedict campus. Joel frequently participates in firing this kiln at his alma mater campus, which is near Joel's pottery studio in St. Joseph, Minnesota, US. 2400 degree Fahrenheit heat changed the clay to ceramic, while naturally coloring the pot with fire and ash. After the firing, Joel added blue paint to the surface of the pot and wiped the paint away using an "inlay" technique. The resulting pot has a rustic, natural surface with deep blue color highlighting the carved numbers. *This photo is an example of the pottery process only, not the actual pot you will be purchasing. Plants are not included.